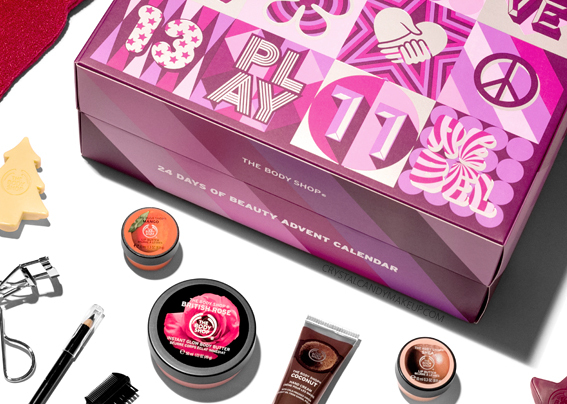 Did you know that The Body Shop came out with four Beauty Advent Calendars this year? Well, I've teamed up with the brand to give you the chance to win one of them, the 24 Days Of Beauty Advent Calendar! This advent calendar contains 24 items : 18 products and 6 beauty tools. I was already familiar with most of the products in this set : I love The Body Shop's shower gels, body lotions and hand creams! The shower gels lather nicely without leaving my skin feeling dry, while the body lotions aren't greasy or sticky. My lips are too dry for the Lip Butters, but you will probably like them if your lips aren't extremely dehydrated! The British Rose Instant Glow Body Butter was new to me though, and it was a nice surprise! It smells great and contains very fine shimmers, so it really give an instant glow. I will need a full size of this one! The only thing I would change about this calendar is the amount of beauty tools. Some of them are great (I love the bath gloves), but the eyelash curler didn't work for me and I could live without the lash comb. 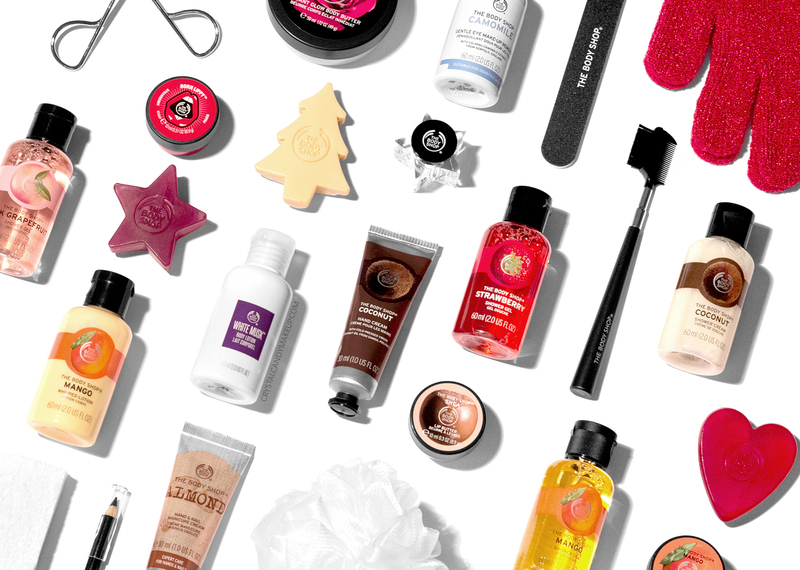 For only $69 CAD though, this is a great way to try a bunch of The Body Shop products! 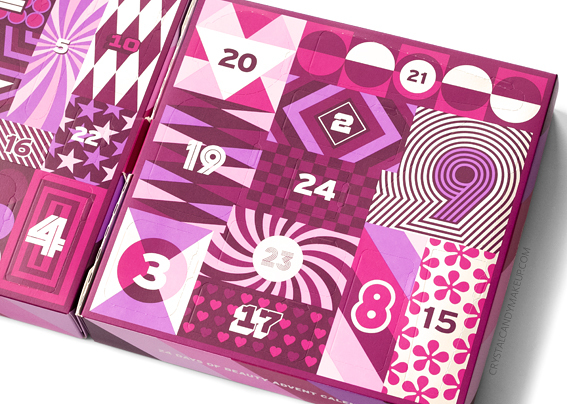 The Body Shop's 24 Days Of Beauty Advent Calendar retails for $69 CAD and is available at thebodyshop.com. Every gift you buy from The Body Shop's seasonal gift collection will help fund the Peace Play Project. Are you dying to get your hands on this calendar? Just follow the steps below and you will get a chance to win this The Body Shop 24 Days Of Beauty Advent Calendar! This contest is open to Canada only and ends Friday December 1st at 11:59 p.m. (Eastern time). The winner will be announced over the week and will have 48 hours to claim the prize. Love the Body Shop for gift giving, so many wonderful things to choose from. I love the pink grapefruit! I like their black musk scent. I prefer The Body Shop's mango scent. i like their fuji green tea! My all time favorite Body Shop scent got discontined this year - Red Musk. I'm gutted. I love The Body Shop's mango scent! I love mini's who doesn't you can't go wrong with any of their scents everything smells so good always. I love their coconut scent! I like Body Shop's strawberry scented product line. my favourite is vanilla chai; my second favourite is Satsuma ! I like the frosted plum scent. My favourite Body Shop scent is White Musk! My favourite scent was discontinued, but I like Satsuma and Hemp. I love the mango scent! I love their Hawaiian scents. My favourite scent from The Body Shop is British rose.